In the past two years, general aviation has had its share of technical revolutions. Consider the introduction of the G1000 glass cockpit and the Avidyne Entegra that have dominated modern general aviation cockpit design since 2004. Also consider the fact that the autopilots being used in these aircraft have also increased in their complexity several folds in the same period. The combination of these two aspects of aircraft operation used to be only thinkable for business aviation, but the recent trends in general aviation design and the advances in avionic design have left us with aircraft that can quickly go faster than our brains. Most manufacturers and some insurance companies have recognized the need to rethink training strategy for new owners and operators of these aircraft. However, the industry consumers have become obsessed with the new panels without seeing a need to invest in the migration to more advanced training techniques, unless they are compelled to do so. There are two types of pilots that we want to explore in this article: Traditional round dial analog panel trained pilots (like most of us) and those who are currently learning to fly on glass cockpit Technically Advanced Aircraft (TAA). This article will consider the effect of these new technologies on pilots and their ability to handle various flight scenarios depending upon which panel was their primary training platform. When the glass paneled cockpits started to appear on general aviation aircraft in 2003 and 2004, the FAA and industry created a series of workgroups and panels to look at how our current time tested training techniques would hold up in light of the changes that were inevitable with advances in technology and speed. One of the things that the FAA was interested in was whether the Practical Test Standards (PTS) were sufficient to test pilots ability to handle the new panels, especially in IFR conditions. They quickly realized that there were many differences in the piloting technique for a TAA aircraft and that changes were going to be required, not only to the PTS, but also to many of the supporting training books, such as the Instrument Flying Handbook, FAR/AIM, and flight instructor training materials. But what changes? How can you pinpoint what needs to change when the most fundamental aspect of the aircraft human interface, the instrument panel, was changing its paradigm from a well-understood analog interface to a digital color interface supplemented by computer inference? The problem became apparent that it was not just the panel changing, it was the entire interface that changed, and with that interface change comes the requirement for training technique changes, as well. The training technique employed must still embrace the classic panel design because there are so many of them still active in aviation today. To ignore the new technology for current flight training is less than responsible because the likelihood is that a pilot will encounter it sooner or later anyways. FAA/Industry Training Standards (FITS) was designed by an industry consortium of stakeholders to try to address this problem before it manifested itself in accidents, which would bring burdensome regulation. It is in the process of being rolled out from the FAA in Washington to the FSDOs as a way to meet the higher demands of the new cockpit designs. I have talked about FITS and its basic definitions in previous articles so I will not elaborate on its structure in this article, except to state that it is different from traditional training techniques because it focuses on using realistic scenarios in a student centric fashion for every lesson, which reinforces longer term learning and promotes safe operating practices. Now by its original design, FITS was designed to do glass cockpit TAA training, but now some proactive organizations are refocusing it to teach basic primary and instrument skills. This is essential for two reasons. First, it is believed that FITS training techniques, if properly deployed, can help to lower the general aviation accident rate that has stagnated for nearly 15 years. Second, because of the rapid industry-wide acceptance of the G1000 and Avidyne Entegra cockpit panels in new production aircraft, many persons now learning to fly may be doing so in TAA aircraft right from the start. The FAA and other interested parties, such as NASA, have contracted research think tanks'such as Embry Riddle Aeronautical University, University of North Dakota under the direction of Dr. Charles Robertson, and Middle Tennessee State University under the direction of Dr. Paul Craig'to research the FITS training philosophy. These organizations are involved in statistical evaluation of the effectiveness of FITS tenets. It is believed that there is statistical proof that FITS is effective and there is a direct correlation between training using scenario-based instructional techniques and the retention of safe operating practices by those who learn using these techniques. But not everybody is convinced yet. To date, few schools have jumped on board. Perhaps it is the cost of redesigning existing training programs, or maybe it is the cost of retraining flight instructors to teach using a different instructional technique. Just how different is it to teach using FITS scenario-based techniques and why have most Part 141 and nearly all Part 61 flight-training operators been so slow in adopting these new techniques? I have heard some grumbling from flight training types that FITS is just an excuse to put another layer of approval bureaucracy in an already over-regulated flight training industry. The industry has also witnessed flight instructors going to factory FITS accepted training programs only to return the TAA aircraft to the new FBO home and pile other CFIs in the cockpit and 'ride around for several hours pushing buttons and twisting knobs' and calling this instructor standardization. This smells like old thinking to me and, if it keeps up, it is only a matter of time before an accident or a series of them causes our regulators to knee-jerk us into another logbook endorsement, such as the complex, high altitude, and high performance endorsements already required by Title 14 Code of Federal Regulations (CFR) section 61.31. The hopes were that the industry, using the insurance companies as the watchdog, would ensure voluntary compliance with the stricter and far more effective training techniques that use student centric scenarios as a way to induce more permanent learning. But this has been slow to develop. Avemco and Phoenix Aviation underwriters both have taken an active role in using FITS training techniques as a yardstick of pilot proficiency. But there still is no industry wide consensus about who needs FITS training and when it needs to be done and exactly who is qualified to give it. Skyline Aeronautics in St. Louis has devoted itself to developing and delivering FITS Accepted TAA cockpit training to anyone who will operate these aircraft. The FAA knows this and so do the insurance carriers because we get referrals from all over the country to take our FAA Part 141 and FITS Accepted G1000 and Avidyne Entegra training programs. Those who come here for these programs know that we are serious about training people using scenarios. The ground school for both of these programs is scheduled for eight hours, but frequently, the class goes for nearly 10 hours in order to get all of the material covered and to address specific questions arising from people's actual experiences. One might ask what you could possibly talk about for 10 hours. The answer is that in order to teach a pilot to operate a technical cockpit and to properly and safely understand the modes of the autopilot it takes that long. Why? The operation of these panels is not like operating a VCR. There are no unimportant features. It is too easy to get drawn into the colors of the multifunction display rather than looking out the window. We find that even experienced pilots can spend close to a minute trying to 'bump-scroll and twist' their way through a series of menus trying to set up an approach or trying to get the autopilot to properly couple. As the speed of aircraft continues to increase over 200 knots, thanks to composite design techniques, we find that using the trial and error method of cockpit management is no longer acceptable for flight safety. The aircraft covers too much distance over the earth while the pilot is engrossed with trying to figure out how to do something in the cockpit that they should have learned before they ever climbed in the left seat. The result is that the pilot falls behind the aircraft and then risks of mistakes pile up. I call it syncing up brain and airspeed. You can call it whatever you want. Another major portion of the ground training class is dedicated to the understanding of the electrical system. When I was taught to fly I learned very little about the electrical system. I did not really learn it until I got my Aircraft and Power plant (A&P) mechanics certificate several years later. In modern glass cockpit aircraft, the electrical systems have been reinforced with dual alternators; backup batteries and split avionics master switches, bus ties, and essential bus isolation relays. Some aircraft have test positions and procedures for the backup batteries and some use an ELT-like battery to operate a standby gyro in the case of electrical failure and have no connection to the rest of the electrical system. It is no longer common sense to train people to operate aircraft without spending time understanding the electrical nervous system and how to handle anomalies. How can a pilot exercise good aeronautical decision making if they do not know how the aircraft works in various normal and emergency scenarios? Now, we are not expecting pilots to be mechanics, but we are expecting that before they take an aircraft on their personal, pleasure, or business excursions they equip themselves with the knowledge of how to identify and handle the most common problems that can arise. 'Remember Apollo 13,' I tell them. When the unexpected failure happened, it was a detailed knowledge of the crafts system and their execution of load shedding procedures that made the difference of success and disaster. Flying solid IFR through rough weather is not the time to be leafing through a pilot-operating handbook trying to figure out what is going on. After all, turbulent, moist weather might be the most logical but least welcome time for a loose wire or connector to show an intermittent warning or caution. We believe in the FITS way of teaching and we think you should, too. We have been getting calls from pilots who want to rent our G1000 aircraft and claim they were 'trained' elsewhere. My customer support team knows the next question to ask. 'Please present us with a copy of your FITS course completion certificate and we would be happy to rent you the aircraft.' 'I did not get one of those,' one pilot said. He said he sat in a classroom for three hours then took one checkout flight in this G1000 equipped aircraft and he was cleared to go. Sorry, I told him. That does not cut it. He could not understand why, since he already had time in the aircraft. Time in the aircraft is not the same as dutiful preparedness. The answer is simple, but the issues are complex. Let us explore several different pilot experience scenarios and look at the ways in which FITS training techniques can be employed in each instance. First, the traditional pilot trained in an analog round-dial aircraft who decide to transition to the TAA glass paneled aircraft. This sounds like most of us, myself included. After flying for 28 years and working in the computer field for 23 years, I discovered the joys of the glass cockpit panels and realized that there is truly a difference between situational awareness and electronic situational awareness. Situational awareness (SA) is the pilots overall ability to apply aeronautical decision making as the flight progresses because they remain vigilant of the current surroundings of the aircraft and know how to remain safely within flight plan parameters. 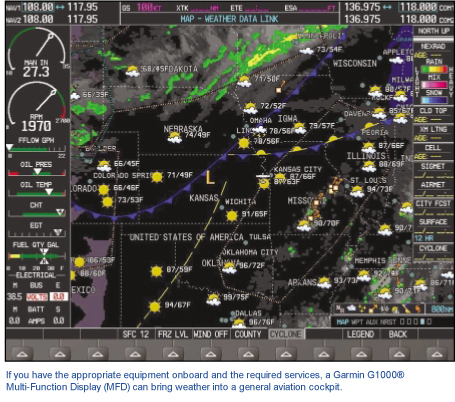 Electronic Situational Awareness (ESA) occurs when the aircraft using its technology provides the information to the pilot by rendering relevant information on the screens such as weather, wind-drift, flight-plan, terrain, and traffic. All the pilot has to do is remember how to call those functions up on the screen when needed. Because of the GPS, skills involving chores that the pilot used to do in VFR by staring out the window and relating what they saw to the map in their lap have gone flat. In IFR, skills involving interpretation of VOR CDI needles and ADF indicators and relating that information to their perceived flight plan are falling into disuse. Is this becoming a lost art? It may be, if you don't keep up with it. It has become so easy to use GPS to get where we need to go, that many of us might be at risk of complacency of our basic IFR survival skills. Now this might be acceptable if we never have a systems emergency or alternator failure while on a night or IFR flight, but who can guarantee this? Flying is risk management and every time we take off in less than perfect conditions, Murphy and his laws are riding along waiting for us to lower our guard. Now, because of my business, I frequently spend time in both types of cockpits, so I consider myself proficient in both TAA glass and traditional analog panels. What about other pilots who do not have the pleasure of making a living surrounded by aircraft? We have discussed the issue that many insurance companies require FITS training in order to complete that transition from traditional to glass, but is there a time limit that might be voided before they can safely move back to a conventional cockpit and take it into challenging conditions, such as IFR and night flight? Many pilots who I have talked to indicate that they could not fathom purposely moving backward in technology because they feel spoiled by the glass paneled technology. That is just the point. What happens on the one day that you 'have' to make the trip, but you can't get the TAA aircraft you have counted on? Now the pilot must make the hard decision. Stepping back into the classic aircraft to make the trip or not. You may be IFR current, but are you round-dial analog-panel IFR current? There is a difference. I recently talked to a renter pilot who completed our FITS TAA training program and frequently takes a DA40 Diamond Star equipped with a G1000 glass cockpit on his trips. He told me that he just completed a trip where there was significant weather between Michigan and St. Louis. He made the trip with confidence because the weather was constantly onscreen with the GDL69 installation and the Stormscope. He further said he was using the fuel range rings to assist him en route doing fuel reserve analysis as he discovered the headwinds were significantly stronger than FSS told him to expect immediately prior to departure. He told me that he would probably not have made the trip in the 310 he used to fly at another FBO. He was actively using the very scenarios we devised into the course and applying the data presented to make safe and intelligent operational decisions. After several years of flying the G1000, would he be ready to jump in that 310 and drive into hard IFR or a moonless sky? In our TAA Aircraft course completion ride, I use a four-airport scenario. The first airport is a VFR arrival at a class D airport with a touch and go and a VFR departure. The second airport is an ILS to a published missed approach to a holding pattern. This is where I dim the MFD simulating an alternator failure and watch the pilot try to figure out how to do an intersection hold with no on screen map and just the CDI and DBAR on the HSI. Hmmm, same results time after time. The pilots get lost interpreting the CDI and figuring out how to set up the 'To' and 'From' of the two defining VOR radials. A loss of Electronic Situational Awareness and inadequate working memory of the IFR basics leads to a potentially dangerous situation. I know they were taught it when they got their IFR ticket, but they obviously are not current using it. Now the flight instructors who teach here know I test this on the final ride so they have now inserted this training into the core scenarios of the program. I have been seeing much better results, but the question is that without scenarios, would I have ever detected this? Would the instructors ever have built this into the training? The bottom line is this: Transition pilots have an erosion of skills in the use of analog panels because the computer and the integrated technology in the cockpit are doing the thinking for them. Is the answer to build more redundancy into the system to virtually eliminate the possibility that these survival skills will ever be needed or is it to beef up initial and recurrent training to prepare pilots on an ongoing basis to be ready for anything? The answer lies in the middle of the two. When I am sure that survival skills are unnecessary, then I will lower the standards of training, but until then, pilots are responsible for currency to both standards. The second pilot group we want to focus on in this article are the pilots trained in the TAA glass cockpit aircraft with no experience in analog aircraft. We are already seeing it. Middle aged professionals coming in laying down the money to learn to fly for a variety of reasons and raising their nose at the prospect of doing it in an aircraft that was built when they were still in high school. They would not rent a car that old, they reason, so why would they rent an aircraft like that? That is great and confirms the reasons we focused on new aircraft as a business premise, but what challenges lie ahead for these students as pilots outside a training environment? Primarily, the aircraft work the same way, so the mechanical aspects of flying remains unchanged. The elements of training that must be addressed are going to be the emergency survival training, the instrument proficiency training, and the operation of the onboard aircraft avionics. These can all easily be addressed with our reengineered Private and Instrument curriculums reinforced with realistic scenarios and a staple of classroom and CBT glass cockpit systems training. The checkride for the Private Pilot can be performed with the same Practical Test Standard (PTS) right now, but this does not do the pilot justice. Should the examiner be requiring more from that applicant? If someone presents an aircraft for a checkride, should they not be tested on any system, autopilot, radio, or emergency concerning that aircraft? What if the examiner has never been trained on that aircraft? Can they safely conduct a checkride on an aircraft they are not intimately familiar with? On multiengine aircraft, the FAA uses a letter of authority (LOA) to designate which aircraft the examiner is qualified to conduct a checkride. There is no such restriction for single engine aircraft. The decisions are left to the integrity of the examiner to decide whether they can safely and effectively conduct a checkride in these aircraft; glass panel or not. I am not suggesting that examiners are not qualified to give checkrides in TAA glass cockpit aircraft unless they have some special designation, as many of these qualified individuals have thousands of hours flying airline transport equipment for as many years as I have been flying. Only they can make that decision using their own criteria and the FAA will make those LOA decisions in due time. What I am suggesting is that examiners should raise the bar when an applicant presents a TAA glass cockpit aircraft for a checkride. In order to safely operate the aircraft as a fully certificated pilot, they are responsible for far more systems and emergency knowledge than for a conventional analog aircraft with a simple electrical system. As we speak, there are groups working on revising the standards to incorporate scenario based techniques into the testing sequence. However, we should be able to make many of these changes without changing the PTS simply by using the special emphasis areas at the beginning of the PTS itself. For instance, item 4 is collision avoidance, item 9 is aeronautical decision making, item 10 is checklist usage, and item 11 is other areas deemed appropriate to any phase of the practical test. The examiner to determine an applicant's ability to safely operate the TAA aircraft can immediately use these areas. What about the instrument pilot applicant? This is where the jury is still out. 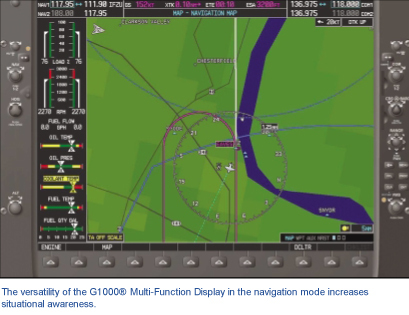 An instrument student in a TAA cockpit may never see an ADF or try to interpret and maneuver to a holding pattern at an intersection with one CDI covered up. These are perhaps the most difficult procedures asked of an instrument student in an analog paneled aircraft and this is where we spent a considerable amount of our training time when we were earning our IFR wings. This is where the instrument student really learns the true meaning of situational awareness in IFR conditions. The needles only present a limited view of the world around the aircraft, but it was the only view many of us traditional pilots had, and by gosh, we had to know them in order to earn our IFR ticket. If a TAA instrument student never gets this tough 'seat of the pants' training and learns everything from looking at the Multifunction Display (MFD) which does the analytical work for them, are they ever really developing the piloting and survival skills that would qualify them to fly in an analog paneled aircraft, even though the certificate in their pocket says they can? There is no doubt that a picture is worth a thousand words and this is certainly true on a glass paneled aircraft display. A perfect example is during an instrument approach. Many approaches consist of a downwind, base, and final vector as the controller is trying to get the aircraft sequenced for the final approach fix (FAF) while keeping other aircraft separated and spaced. The MFD displays the aircrafts exact position, with a wind box indicating actual wind speed and direction, the aircraft projected flight path (where the aircraft will be in one minute), and the magenta line which represents the final approach course on the moving map, as well as distance and bearing information to the fix. Now the instructor is sitting there watching the approach unfold and is mentally calculating at what point the controller will issue the next turn toward the FAF. What is the student thinking? In the old days, they were moving their eyes rapidly around the cockpit trying the keep the aircraft flight parameters in check while waiting for the needles to start to move in the correct direction. While the needles were on the pegs, all that a pilot could do was wait until the aircraft approached the hot zone of the instrument when the needles would start to move toward the center. At this point, all the action begins and there is a mental coordination between turnings at the same rate as the needle while at the same time trying to calculate and apply appropriate wind drift so as to capture the centered needle exactly at the moment the required wind drift is applied. This is not a skill that is learned by reading a book and it sure won't magically appear as a skill on the resume of one who was not trained for it. In TAA aircraft, it is different. 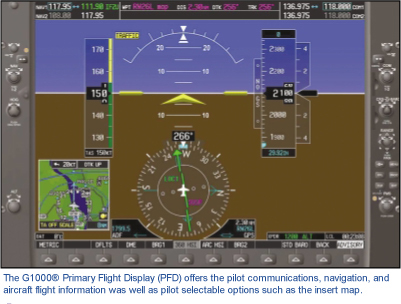 The pilot uses a different part of their brain as the computer-generated images on the screen draw the picture of what is going on and your job is to interpret it and react accordingly with additional inputs to the flight plan or autopilot as needed. The pilot has become a cockpit automation manager. Checklists complete, the pilot have coupled the autopilot to fly the approach and they are watching the action on the MFD as if they were playing a video game. Now this is great and, believe me, it is every bit as satisfying to drive the aircraft to a safe landing, but how ready is the pilot if you take the picture away? If the MFD goes dark or because of an alternator failure the pilot has been forced to turn it off as a load shedding procedure to conserve power for landing because he needs the battery to lower flaps and the landing gear, what is the pilot's next move? It is by the law of primacy to revert to their basic instrument training and use the HSI and the CDI needles to navigate toward the final approach course or holding pattern. What if the pilot was never trained for instrument in a round dial analog aircraft? There may be no foundation for them to fall back to. The picture is gone and now the analytical decision making part of their brain has to kick in and that part may be underdeveloped. One technique we use during IFR flight scenarios and when testing a students understanding of Electronic Situational Awareness is to ask the student to talk about what the controller might do next. This forces the student to use mental analysis to put together the answer on the fly. They must glance at the trend vector to determine how many minutes or seconds until crossing the final approach course, look on final approach for TIS traffic displays (if available), glance at the HSI or NAV compass rose around the aircraft and come up with an answer like 'it looks like in 30 seconds the controller should give us a left turn to heading 320 which will put us at a 30 degree intercept angle to the final approach course just outside the outer marker, but with the current winds, we may be pressed for time over the marker so lets do our checklist now.' This is a true educational moment. You can feel it in the aircraft. At this moment, both the instructor pilot and the pilot in training look at each other and smile because the pilot in training now gets it. They have demonstrated both an understanding of the technology and used electronic situational awareness to predict a future sequence of events based upon that technology. It means that the student is ahead of the aircraft, and this is essential for safely operating any aircraft, but especially these TAA aircraft whose speeds are now topping 200 knots in many models. Be careful. Just because a pilot can do it with a moving map, does not mean that they can do it without, such as would be the case after a MFD or alternator failure. We must not let down our vigilance and assume that since we have systems redundancy built into the aircraft that we will never encounter a problem that requires reversion to an old skill. We must continue to teach all students basic IFR navigation and survival skills in addition to all of the new technology that comes our way. We must continue to create scenarios that will realistically force the student to use the analytical portions of their brains so that they will be ready for that dreaded day when the red warning light comes on. Those same skills will keep them ahead of the aircraft when they finally move from the 120-knot aircraft to a 200 plus knot aircraft. Mike Gaffney is an FAA Aviation Safety Counselor, A&P mechanic, ATP pilot with a CFI, CFII, and CFMEI and over 3,200 hours to his credit and is a Cessna, Diamond, and Symphony Aircraft FITS Accepted Instructor. He is the author of the ASA G1000 Complete Tutorial software. He was designated a Master CFI by the National Association of Flight Instructors, and was designated the Greater St. Louis Flight Instructor of the year in January 2006. He is the President of Skyline Aeronautics and Beuco Supply Company at Spirit of St. Louis Airport. He can be reached at mmgaffney@skylineaero.com.